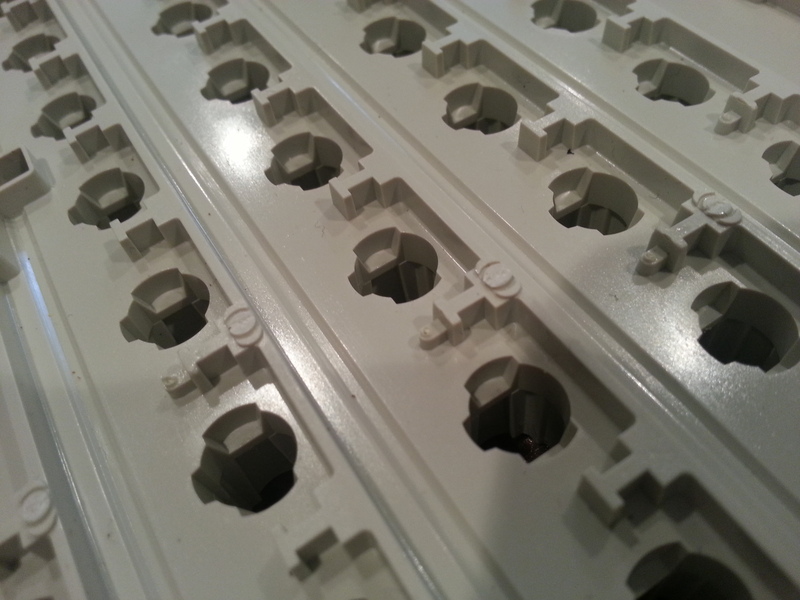 Model M bolt mod tips and tricks. 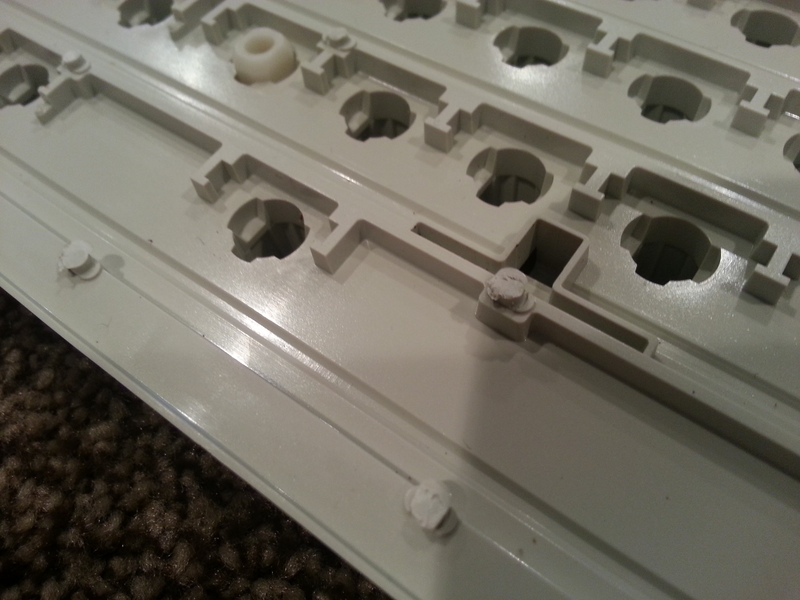 I will be thoroughly documenting my model M bolt mod. I've done a bunch of these, and picked up some tips. Why publish an extensively photographed guide? My hope is to make it easier for people to see how I recommend doing it, and can see the effect of some of the tips I mention. With luck, this will remove the blocks for some people and allow them to start bolting their own model Ms. I think the hardest part is the actual drilling, so Most of these tips are geared toward making that part as quick and easy as possible. Enjoy! 5.5mm or 5/32" 7/32" thinwall nut driver. 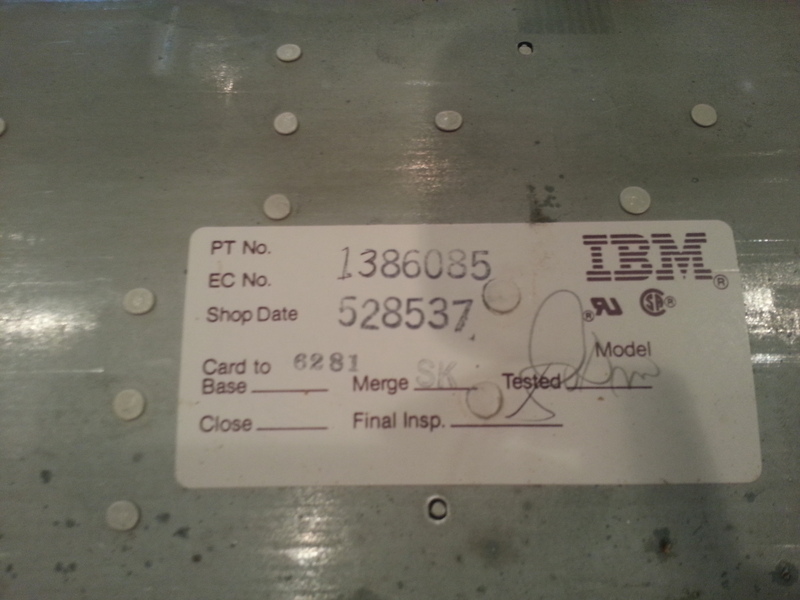 This is what we have to start with: Model M 1391401 from 1989. 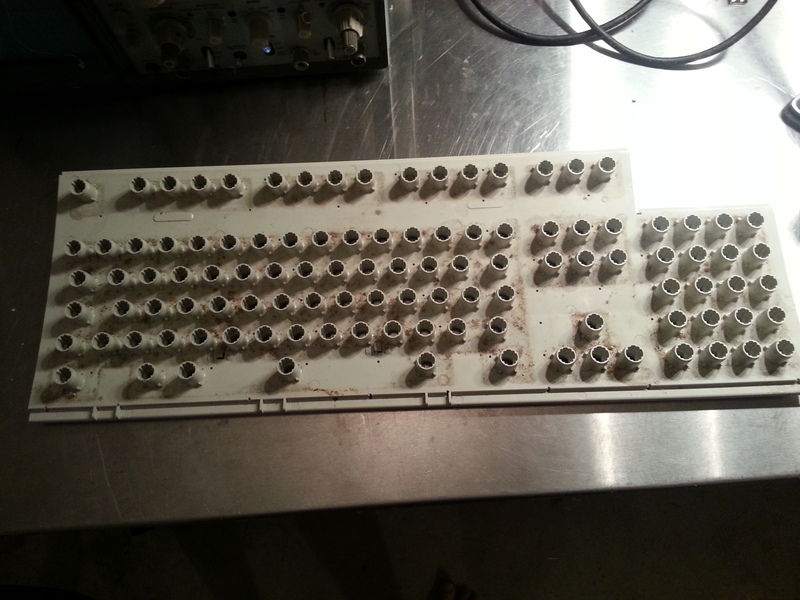 Missing keycaps and very dirty. Take the screws out with the nutdriver. A closeup on the corrosion. Some more corrosion in a different area. 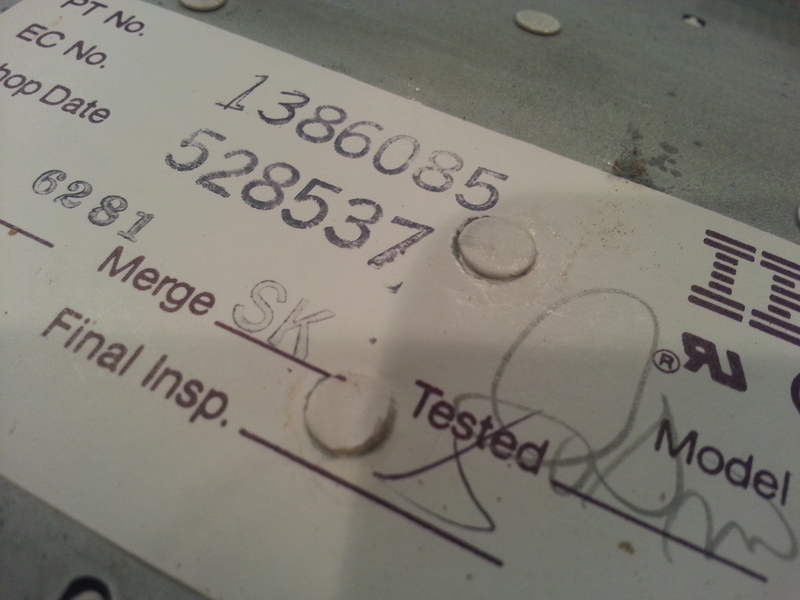 Picture of the label: note the stamp didn't fully strike and the number was fixed by hand with a pen! These guys took pride in their work. Smaller label in the corner. 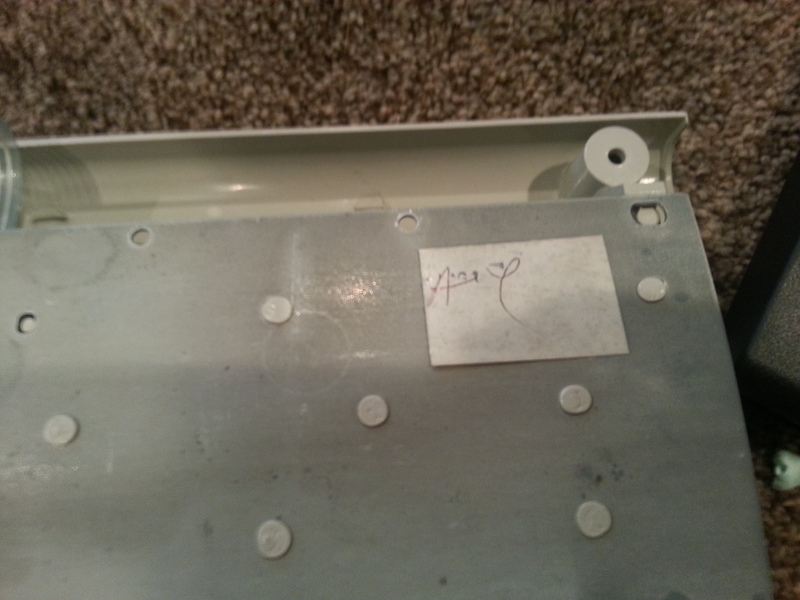 To start, I edge around the two rivets under the label with a fingernail (flathead screwdriver works too). I'll remove just this piece. I like to keep the label in as good shape as I can, but I don't mind the small hole in it. 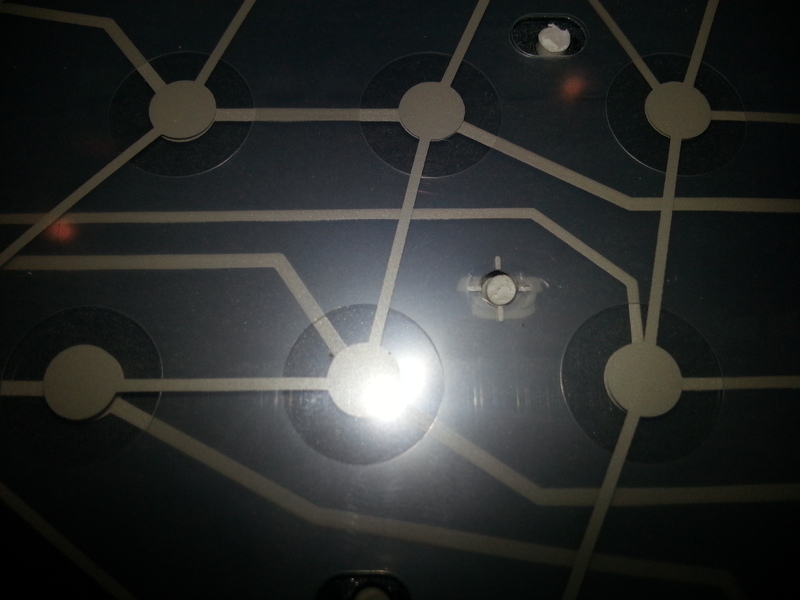 closeup of removed rivet. Note there is some plastic still left on it. Don't worry if this happens, as long as the backplate can be removed that's ok.
Another rivet cut off: this one looks a little better. You can see I've scraped the plate a little with my knife. The plate's getting sanded anyway so I don't care about the surface, but it will dull your knife faster. I recommend trying not to scrape it. The hardest to remove are the two under the label.I try to work them out piecemeal. You can see here. 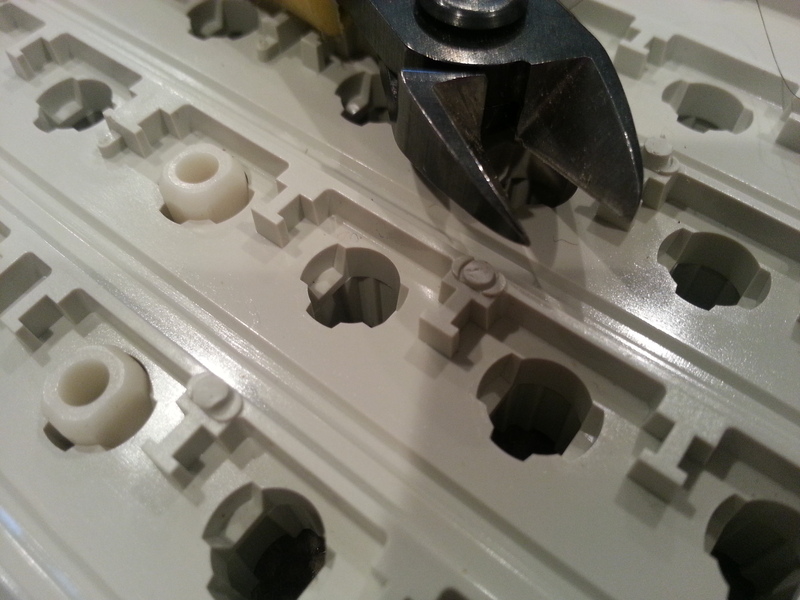 Once all the bolts are cut off, you have to pull the pieces apart. I usually start at one side with my fingers. You can also start at the left edge instead of the top edge. There are two locations where there is only a tiny hole in the membrane. This is to ensure it stays seated properly. Grab some flushcutters and clip the remnants of the top of the rivet off so you can pull the membrane out with no trouble. Now the membrane can slide off it. We will still need to re-clip this later. Springs and flip plates (hammers) are in excellent condition! 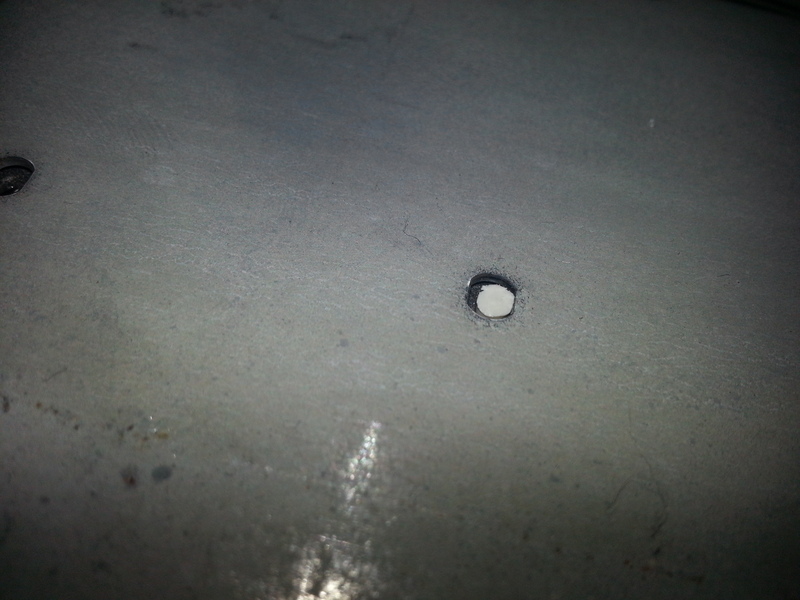 Shot of rivets that need to be clipped flush. Note the two halfmoons on either side of the rivet. I try to clip them flush with those. 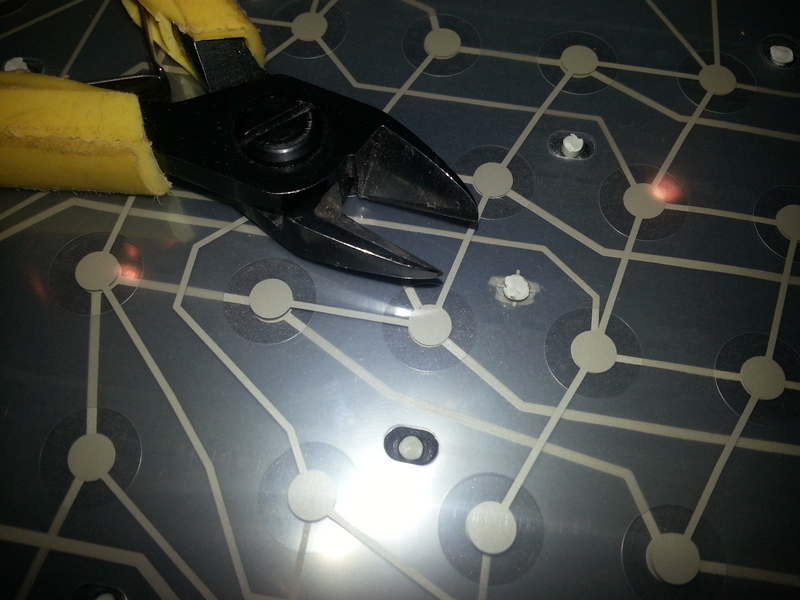 I try to align the cutter this way so that I can clip the rivet flush with those halfmoons. This makes the next step easier. closeup of above with flash. You don't have to spend tons of time making sure these are perfect. another clipped rivet. Notice how nice and flush it is. 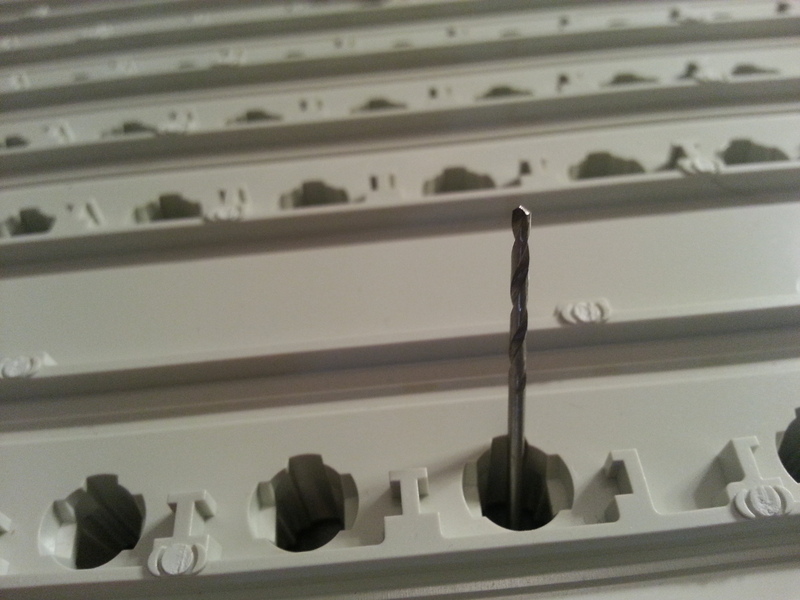 You need these to be as flush as possible (within reason) or the drilling will be much harder. You can be off a little bit, though. 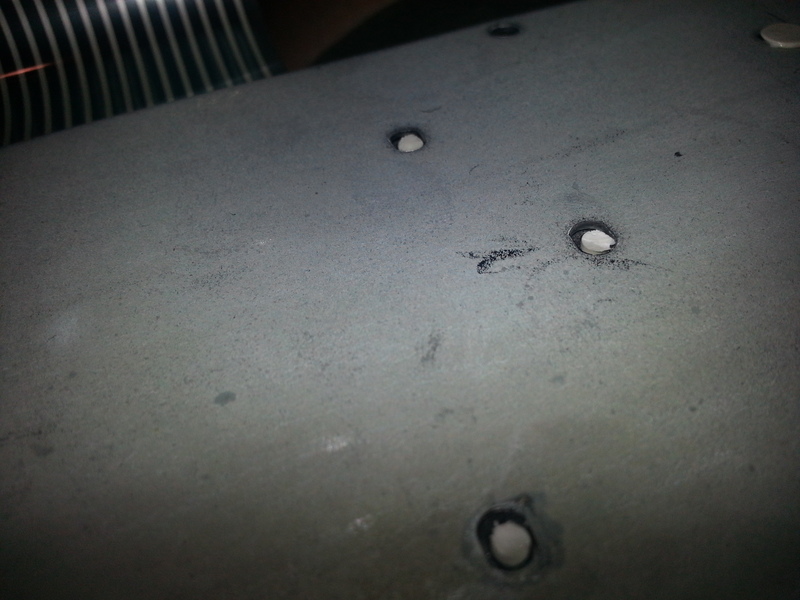 better shot showing surface roughness of clipped rivet. (no picture) I start at one end and go from one side to the other. The plate has some bend in it still, but the unclipped rivets can interfere with you clipping your current rivet you're on and make it hard to get flush. shot with flash of clipped rivets. Up until now I've kept pretty much in line with the standard bolt mod. Here's where I start to diverge a little. 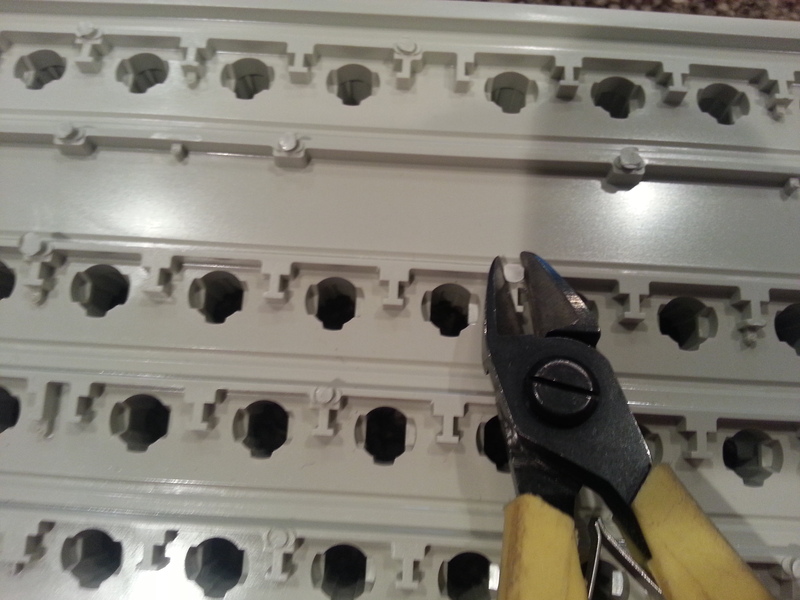 The hardest part for me is drilling all the holes straight, so I make that step as quick and easy as I can. 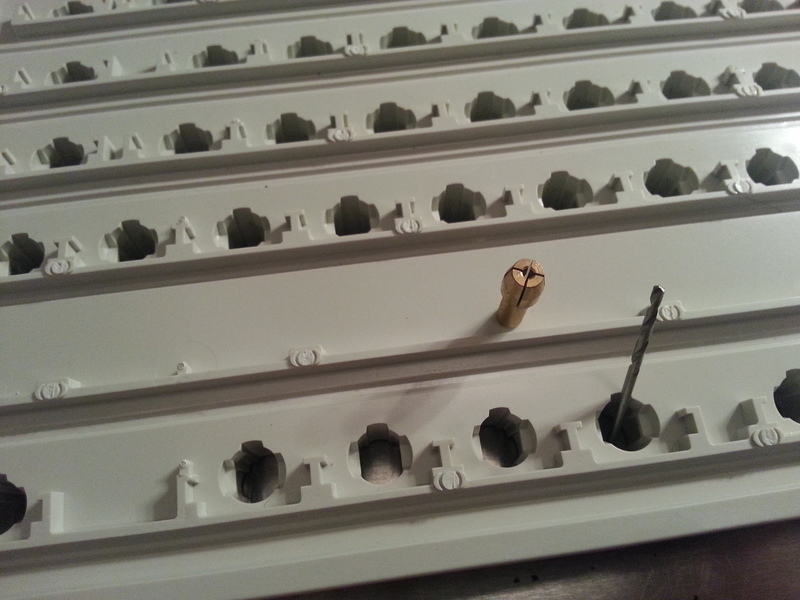 So I prep each hole for drilling. This also allows me to go a little faster on previous steps because I can account for small variances and inaccuracies there. This is the longest part. Make sure you line it up right, and take your time the most here. This is a ball end bit for my dremel rotary tool. I don't know what it's called specifically, but the end is shaped like a sphere. It's metal, hard, and cuts through plastic easily. I use this to make a spherical divot in each of my places to stabilize the drill bit when I drill. Here's my rotary tool! I usually only use speed 2 for bolt mods. 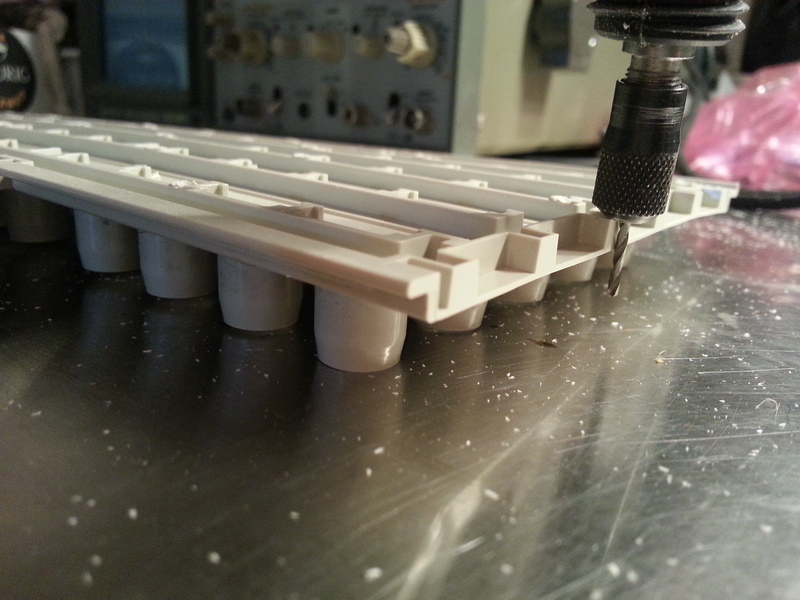 The holes will be made with a 1/16" drill bit. 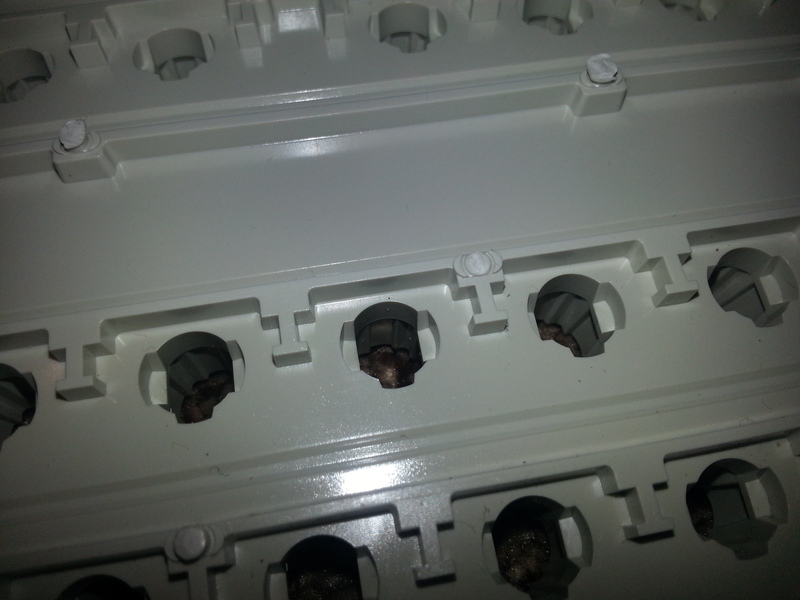 We are using it instead of an m2 bit because this makes the holes slightly smaller than the bolts. 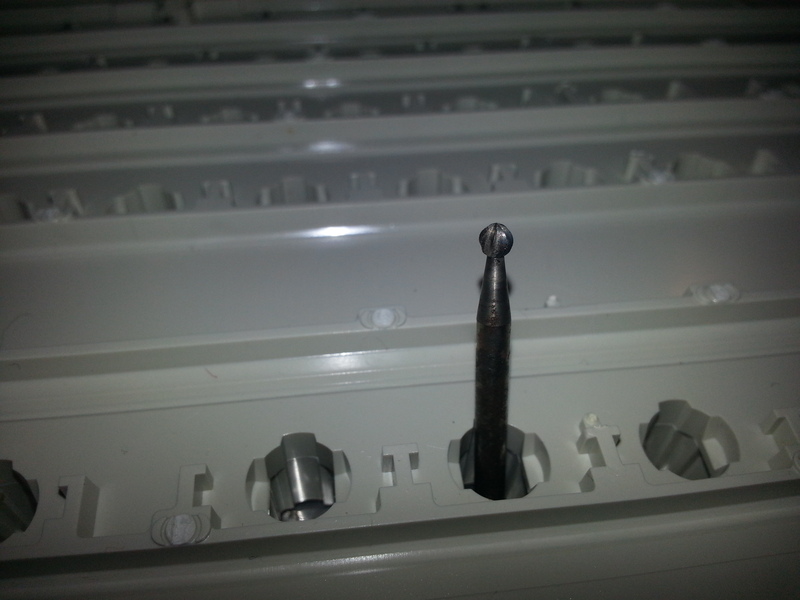 This means we can thread the bolts into the holes so they stay in place when we are fitting it together again. 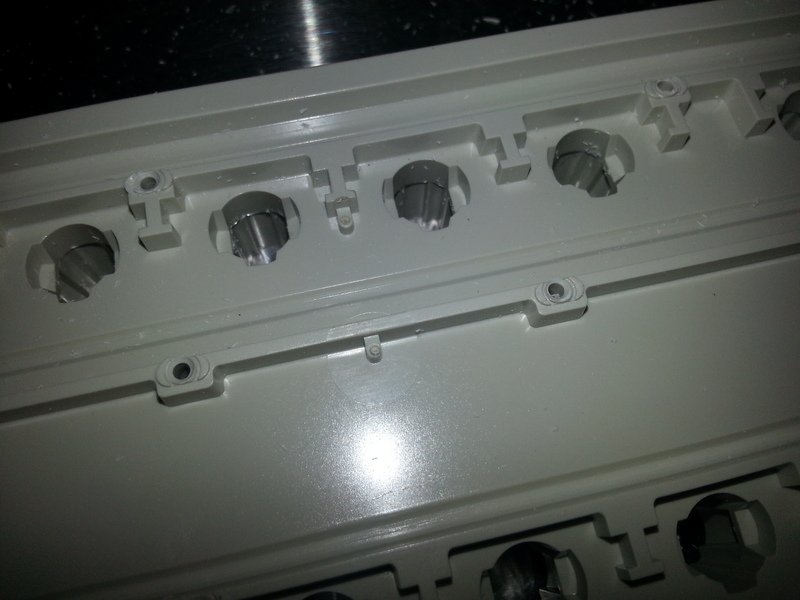 The 1/16" bit needs a different collet than the ball head bit for the rotary tool. I had to buy these online. 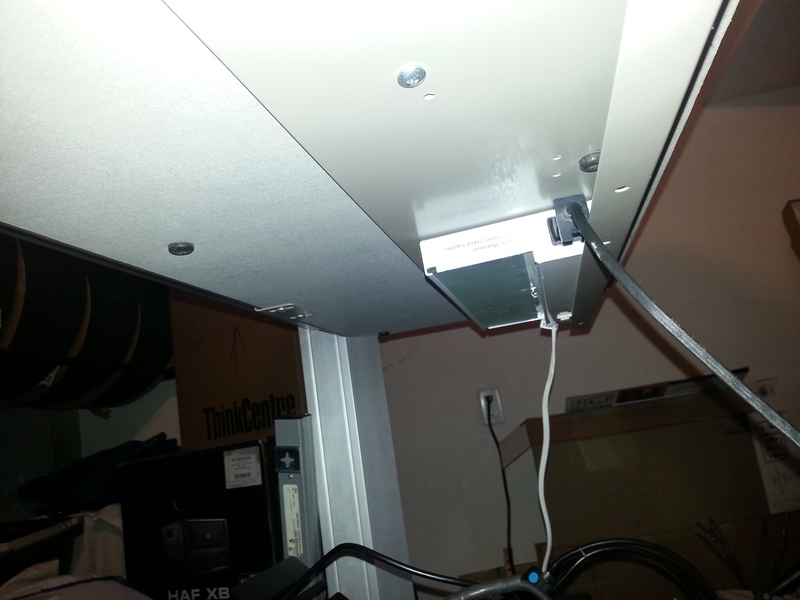 The light on my workstation has a plug on the end: perfect place to plug the rotary tool in! picture of what it looks like when I make a proper-size divot. This makes the drilling go so much easier. Here's another good divot. You can make them a little deeper if you want. 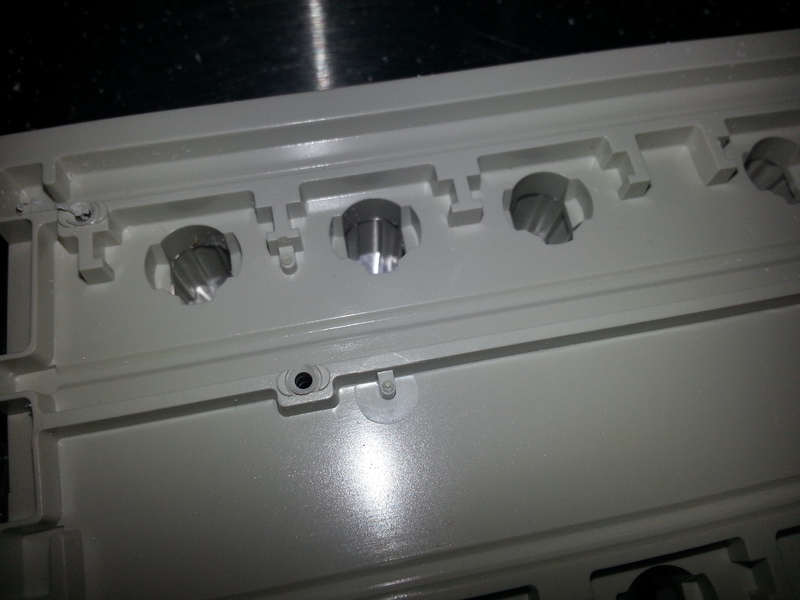 1/16 bit fit in rotary tool. Notice that I don't leave much exposed. 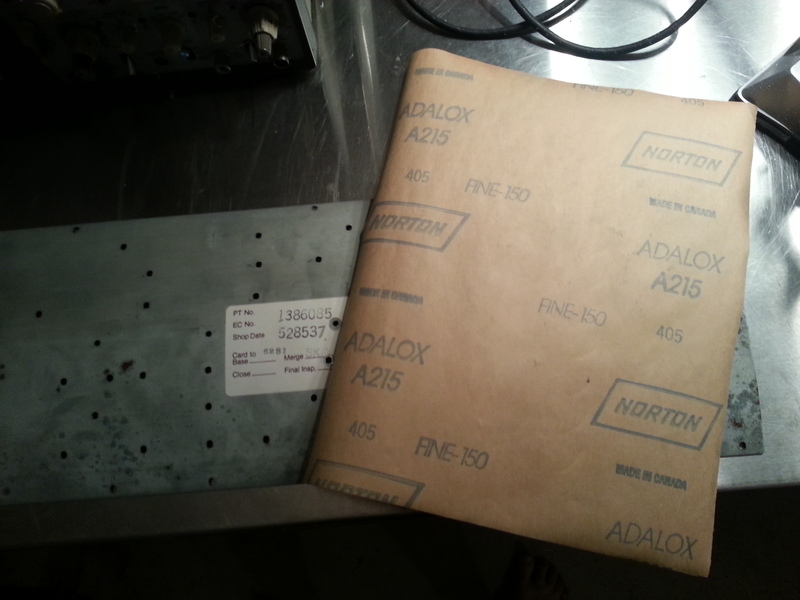 This will ensure that I can't drill into my nice stainless steel worksurface after I've drilled through the plate. 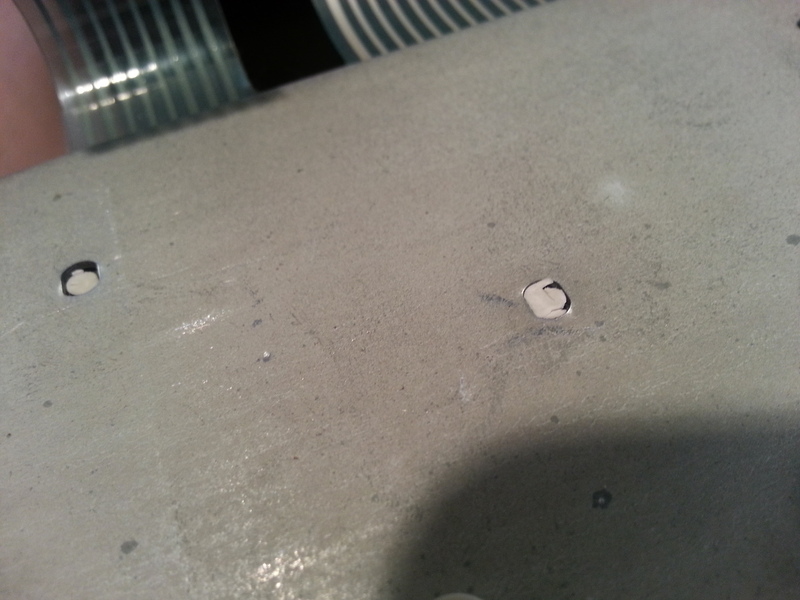 I'm not sure if that cheap harbor freight 1/16" bit is hard enough to drill through my nice worksurface, but I also don't plan to find out. as you can see there's a gap. 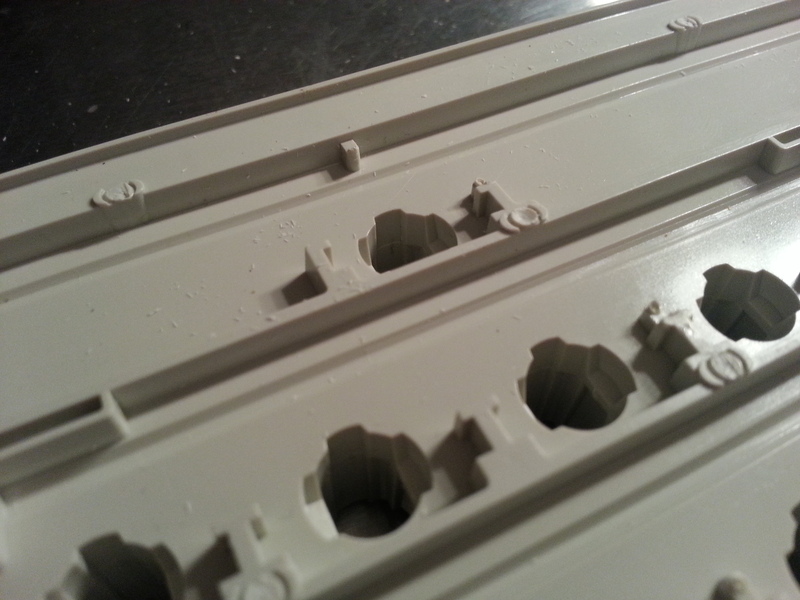 here is a picture of some drilled holes. Notice that it's very well centered! The drill bit does not "wander" at all with those divots in place. Drilling is fast and easy. Most of the holes come out perfect. The rest are close enough that they'll be fine. The hole on the left has some plastic in it. Just remove those later. I dust off the barrel frame ("chimneys") after I'm through. Also see how nicely centered the hole is! Those divots take up a lot of time to make one in every single rivet place, but it saves time later with the drilling and makes it a lot harder to mess up. 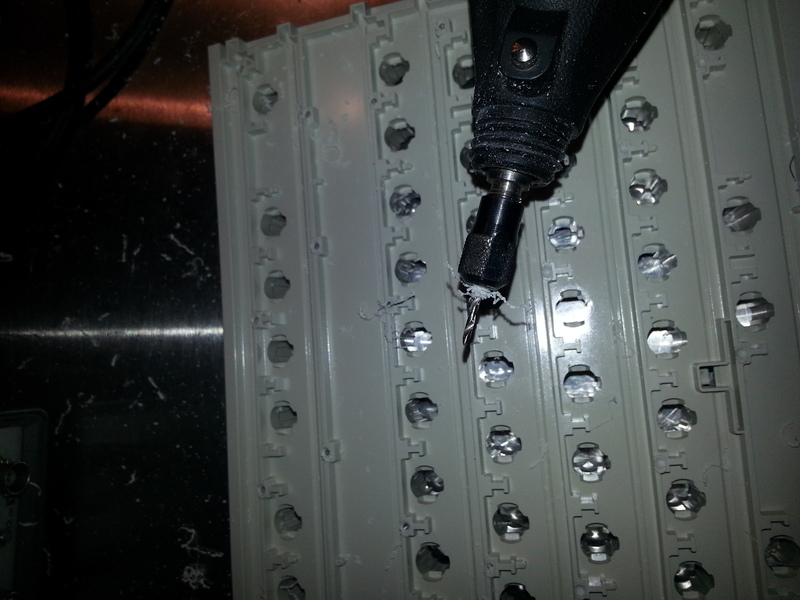 after a while, plastic will build up on your drill bit like so. Make sure to remove it every once in a while. 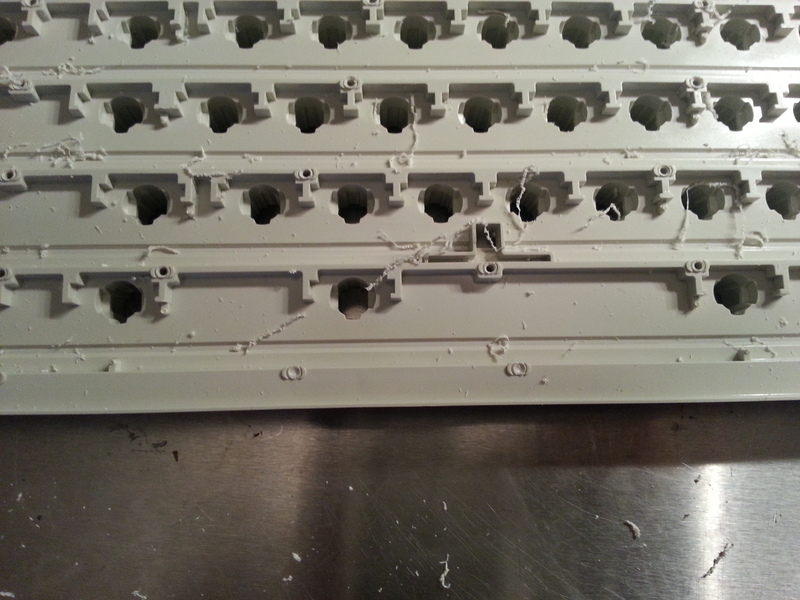 It's possible for the plastic to build up, and then melt, and then it's hard to get off you bit, but the worst part is that the melted blob of plastic on the end can abrade your hole making it too wide! This isn't a catastrophe if it happens but is very annoying. Just clean your bit every once in a while. 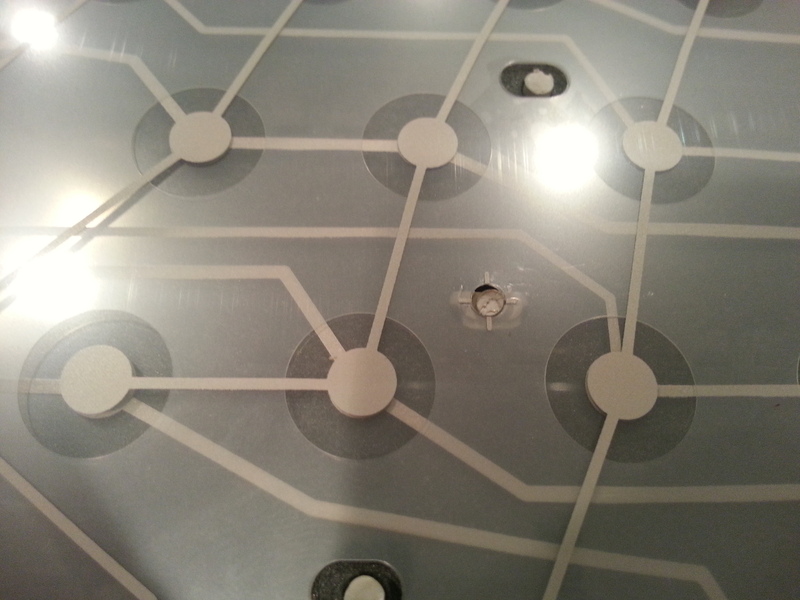 Ok holes drilled! Now we need to dust off all that mess on the barrels. 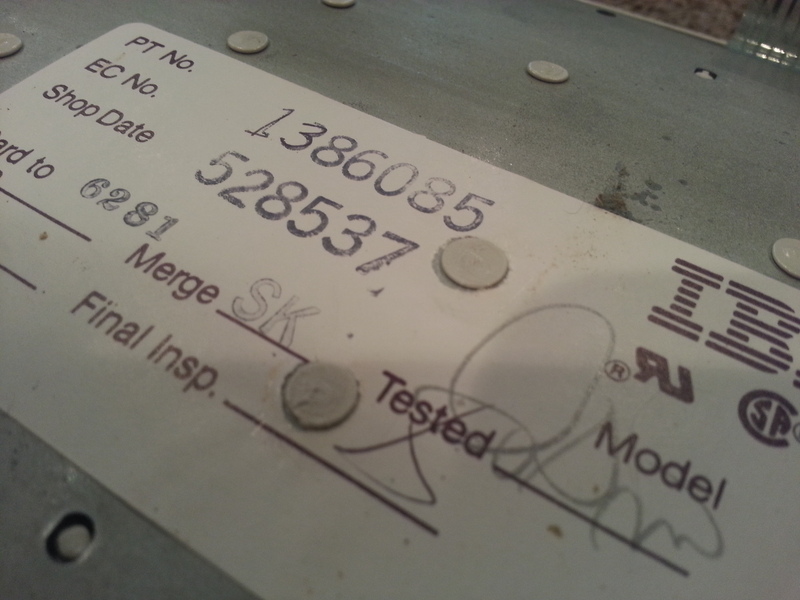 Oh right, it's still all dirty form being used and/or stored for the last 25 years. At this point, I just put it in the dishwasher with the dirty dishes and run it. another shot of dirty frame before dishwashing. While we are waiting on the dishwasher to get done, let's take a look at that plate. I have some old sandpaper left over from something. I guess it's 150 grit. Time to get started with some elbow grease! 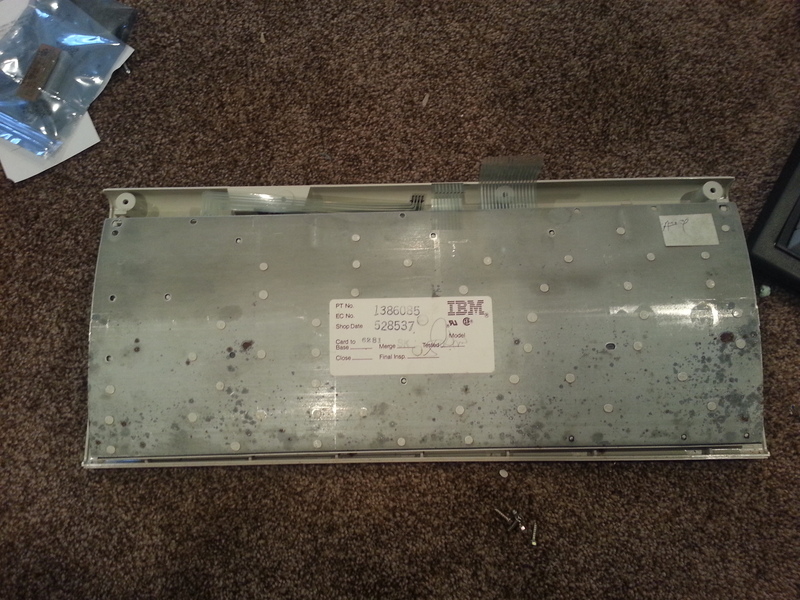 Starting to look much better now only because the flash reflection hides most of the corrosion. Even without the flash it's looking a lot better. I hope it'll be ready by tomorrow. I'll be adding the rest later. Mod Edit: Corrected that 5.5mm is 7/32" and not 5/32". Good tutorial, and great knife. The Emissary is one nice looking blade. no doubt; the best guide ever. It leaves out no step and the tools are clearly shown eg some folks (such as me) didn't know what a ball end bit is. Even if that is not the official name at least having photos clarify. I've used it so heavily and sharpened it so much over the years (I take the hones to it about once every 2 weeks) that the blade profile is beginning to change. I'm thinking about sending it back to benchmade to get it repaired. I always finish it off with a 2000 grit sapphire polishing stone, and I never have to start with anything below 600 grit. Well, I plan to leave out no step (or tip) once I'm done writing it. I still have to cover the actual installation, etc. Everyone feel free to post your own tips about bolt modding here. I know there's got to be some good ideas I haven't thought up. I'm also touching on some basic refurbishment things you can do like dishwasher the barrel frame (chimneys) and clean the rust off the plate. It still looks good . I have a 3550 auto, Auto Stryker 9100, and just got a 530. I've had one of the autos for about 5 years now, and it's still going strong. I'm not sure if they still do (although I think they do), but Benchmade use to replace any of their blades for $20 if you send it in to them. I like the idea of the spherical burr tip to prep the tops of the rivet stems. I have been using the point of a soldering iron but I think I will try your method next time I do one. For my rivet cutting I have been delighted with the results of using a chisel tip on an Xacto ("exact zero") knife. I use an older blade to cut the rivets on the back plate, since it is devastating to edges, and a fresh new blade for final shaping. I have always tried to leave the cut-off-rivet-stem-posts as tall as possible. They passed through the plate all along, anyway, and their slightly larger diameter might provide better alignment. After the cutting and drilling, I carefully shave the top surface flat with a single stroke of a fresh sharp chisel blade. It takes both hands, reading glasses, and a careful firm push, but the results are really nice. 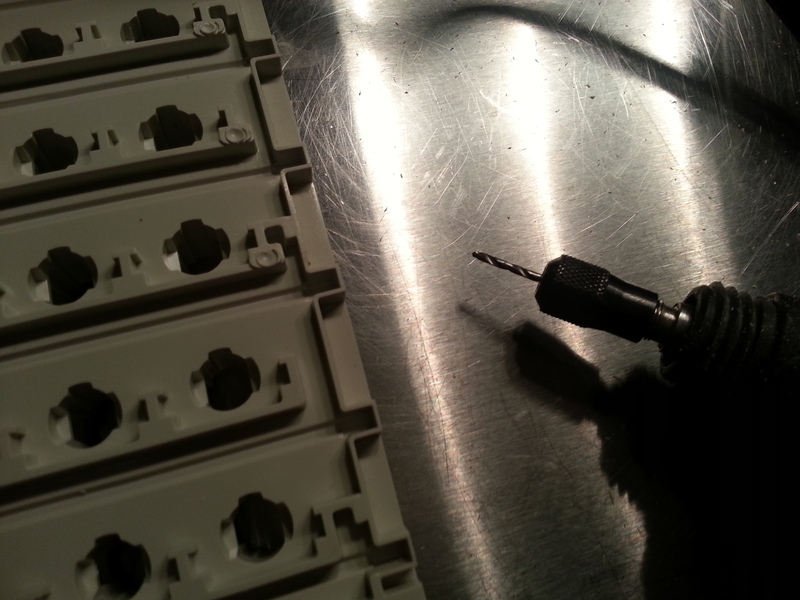 The 1/16" drill bit is also the best way to go. 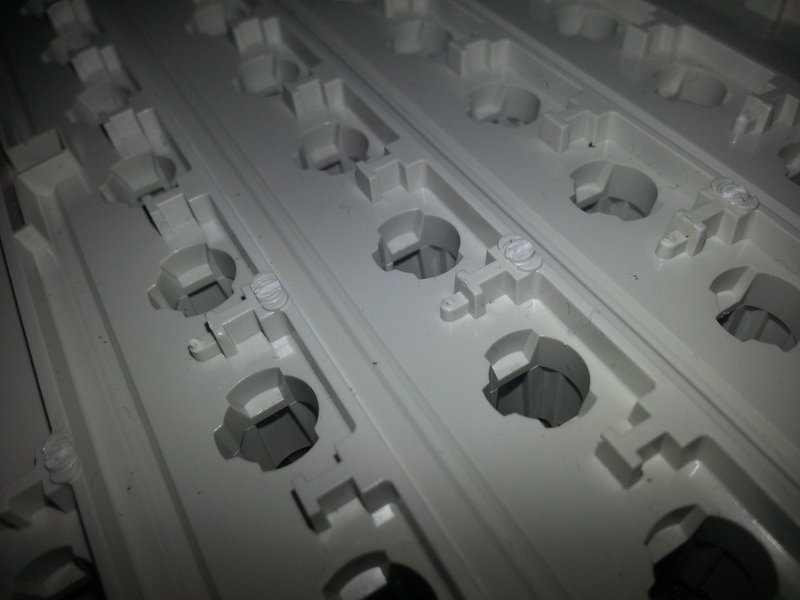 It takes some small extra effort to drive the screws through, but the snugness of the set has got to help overall. Build yourself a frame. A 1x2 costs less than a dollar and takes 8 nails. I used to think "if the rivet posts are too high (and go past the level of the plate) they will interefere with the bolt positioning" but then I thought about it. Now I'm thinking that "if they are too high" it'll be harder to make a straight hole in them. This may or may not be the case. It's possible that it's just harder to tell if it's straight if the post is low. I will keep that in mind. I have some wood left over from out recently built garage. I plan to make both frames with it. The "spherical burr" tip is excellent. I used a soldering iron on one of the older ones I did and it wasn't too bad I guess, but this way is very nice. I spend more time making sure the spherical divot is centered than I do actually drilling, but if you start "off" a little, you can just move it over as you go down. Then the final spherical divot is centered and ready to go. This also means you can spend less time and effort on other steps clipping the barrels. You can be "off" quite a ways and fix it with the burr tip. I go straight down with it, you can in theory approach from the side of the tip, but it likes to catch, jump, and damage the plastic. Another valuable lesson from Fohat! I think it takes experience to figure these things out. One's tools and work space are important for getting things done. 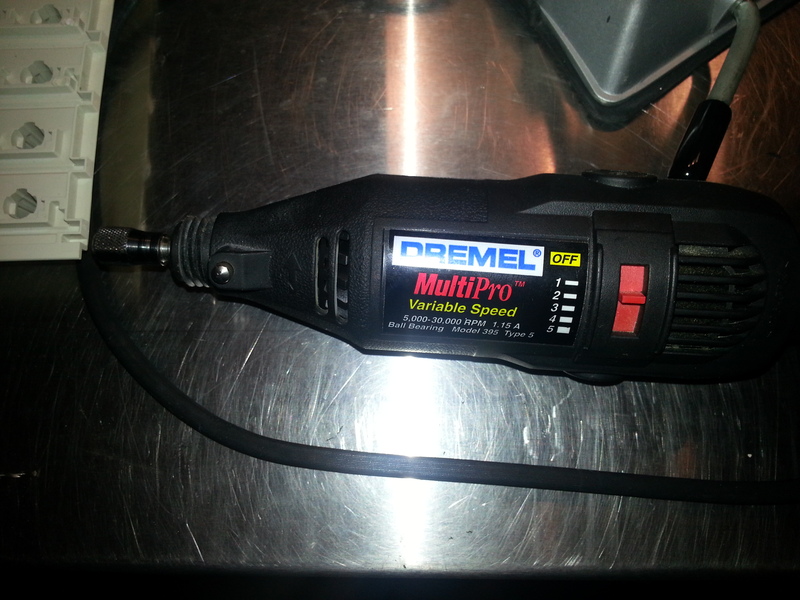 I am spending several hundred more dollars to get a good dremel and a bigger clamp tomorrow. Still, I don't think we need frames for this project. Clamps will work just as well. Put the M on top of anything and use clamps to ensure no movement. 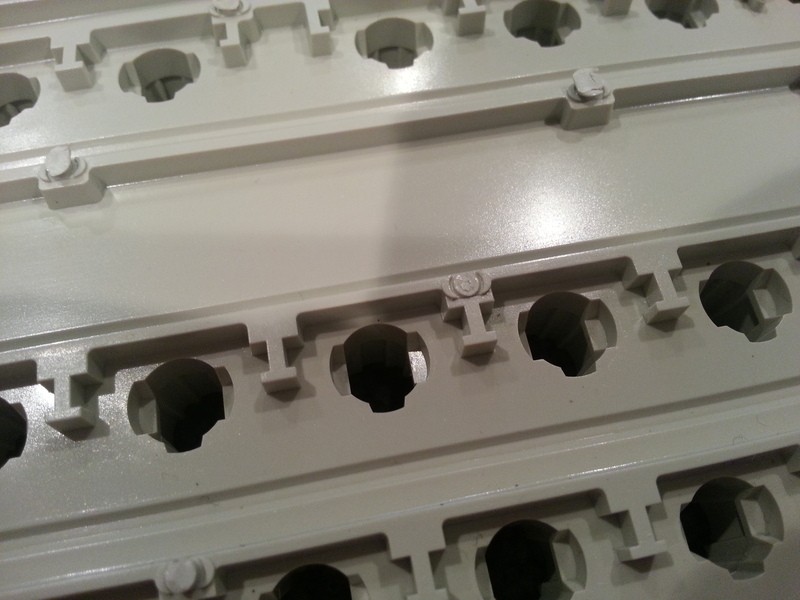 The purpose of the frame is so you can seat all the pivot plates without them jumping out. The spring is in compression a little, and sticks over the top of the barrel. This means that if you set it down on something all the springs will jump out. I don't think I've ever needed to use a clamp for a model M bolt mod, but it's a good idea (when you get started turning all the nuts). Instead of using a frame, I had used two books, but now I just use the case, or two keyboards since they're so handy. 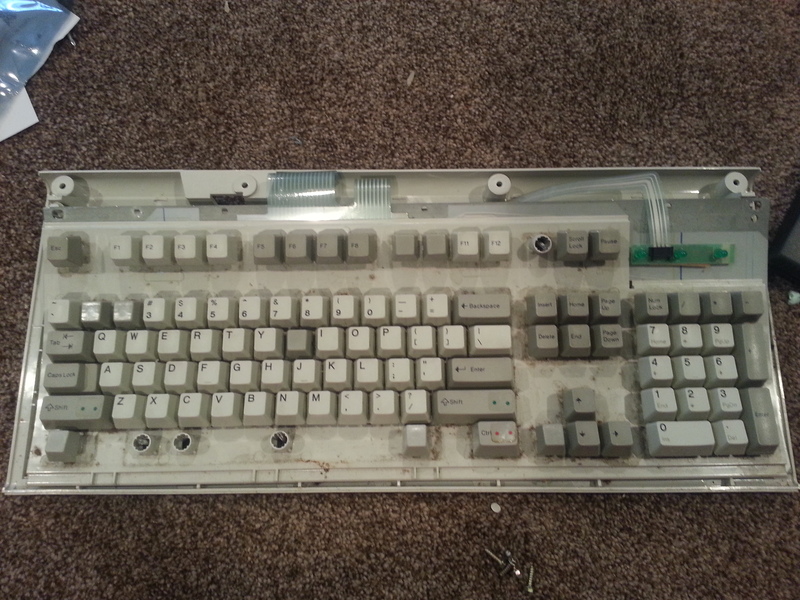 I just used two IBM "unsaver" model Fs to help put this realforce back together. But if you want to do this more than once, a frame is the way to go. This couldn't come at a better time, I'll be bolt-modding my first M this coming week! Thanks for all the effort documenting things, I think I'll definitely pick up one of those ball-end bits. I painted my F plate with rustoleum and it seemed to work. I want to get some clearcoat for the M plates though. I mean we aren't storing these in the rain. 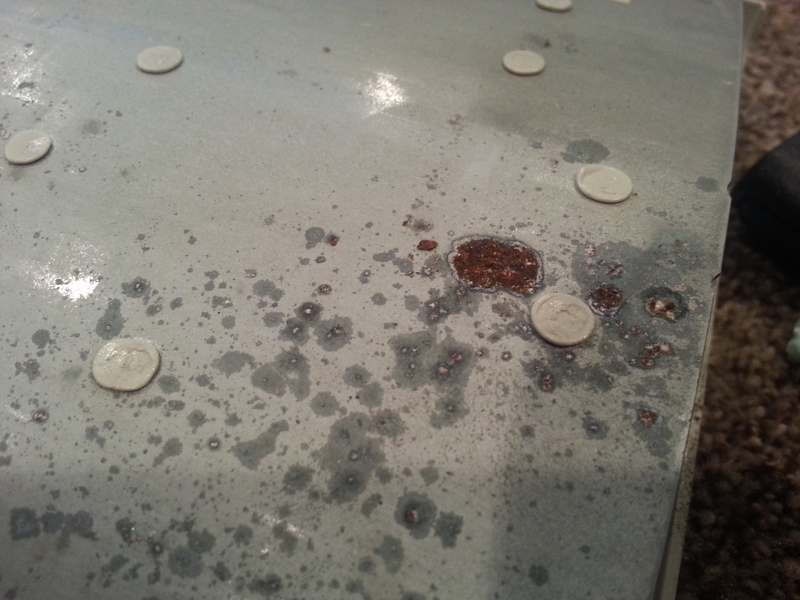 As long as we keep the oxygen off and don't pill too much coffee into them, they shouldn't corrode. Yeah I mean that's what I've been thinking too, but I figure while I'm in there I might as well go the whole 9 yards. Plus IMO the plates, especially on earlier M's, are really great looking. 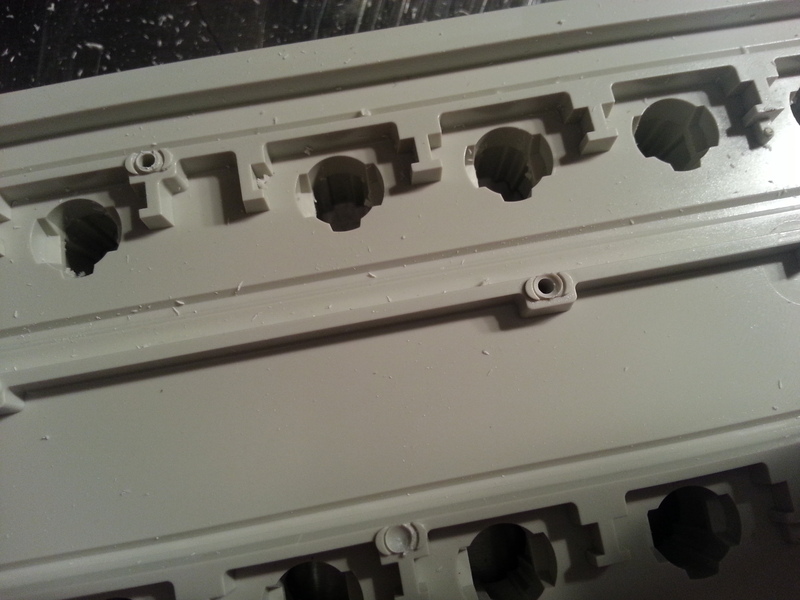 I think the clear glossy Rustoleum I got should accentuate that, not that it's really visible once assembled. Any experience replacing the "blanket" or foam mat? Again, totally not something that needs to be done, but I've read that the new ones Unicomp sells are made of a bit thinner, more springy material. Might give it a bit more lively feel. I've got one in the mail to me now, so I can report back once I've got it in. Yeah, I prefer unicomp's "blanket" to IBM's. The IBM is two layers or something. Unicomp's is just one and much thinner. I did that when I bolt modded my 1390120 (and CPTbadass's SSK) and it's the crispest feeling M I have. I try to shave the "mushroom heads" off as cleanly as possible and leave a good "stalk" to work with. That thing looks like it would rip them out by the roots. Haha, well I did it on a Unicomp and it pretty much shaved them off with little effort. 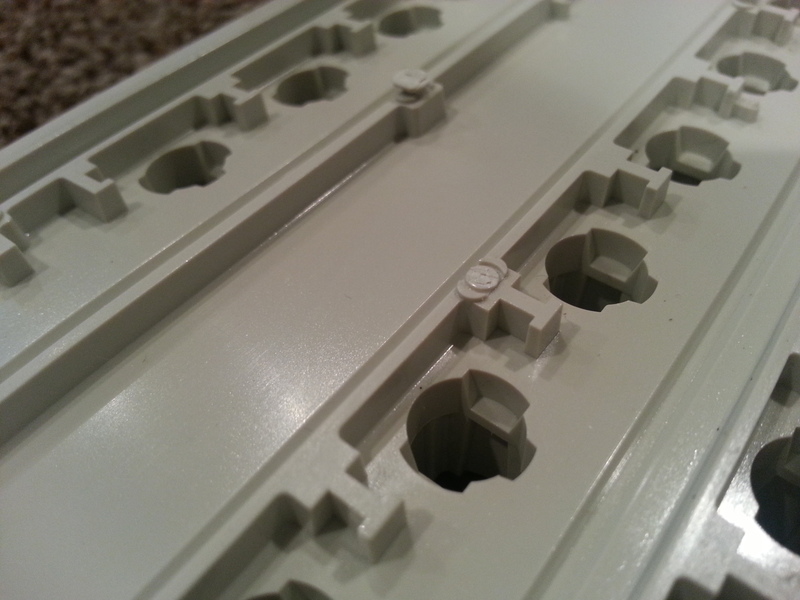 I wonder if the plastic rivets on the Model M's are thicker/stronger than on the Unicomp? This is my first bolt mod project! The AT&T KB305 might be a little different as I think they use a slightly different plastic for the barrels. Mine has all rivets intact so I haven't boltmodded it yet. Update: all photos taken for pt2, just need to upload them. about shaving the rivets. Other people have used an xacto knife, boxcutter or sharpened chisel. 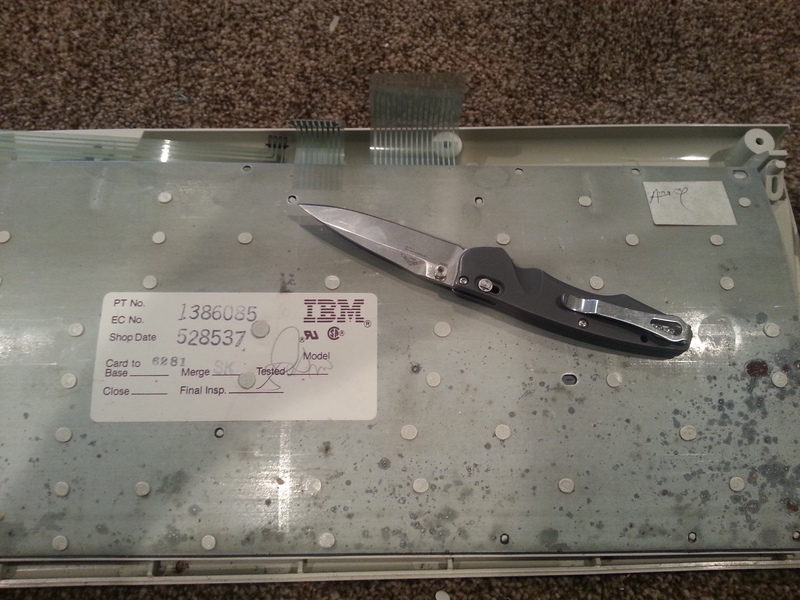 I have only used a boxcutter and a very very sharp pocketknife and of the two, I much prefer the latter. I try to avoid metal with my decent knives, even though they can be sharpened. 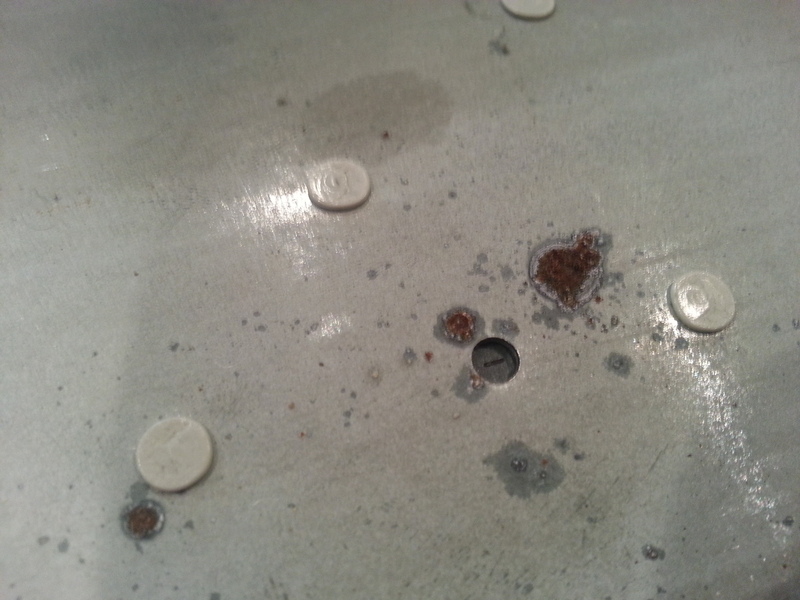 There are burrs and irregularities on the plates that can't be good. The chisel blades for the Xacto knife are cheap enough. I use a good new one for the fine work, rotate it to the ugly plate work later in life, then throw it away. These have worked great for me. 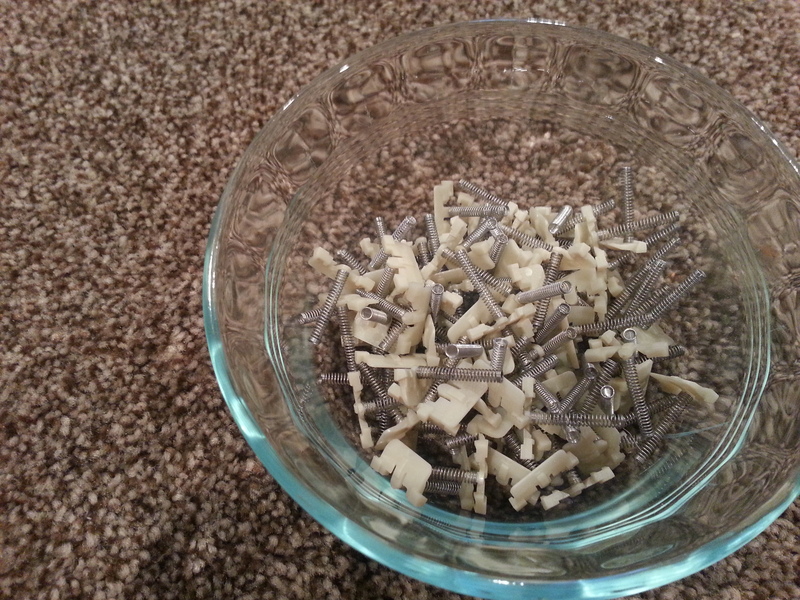 The bottom item is the self-tapping screws which are probably unnecessary. I'll second this. My SSK is the crispest M I've ever felt. linking to mcmaster is a huge pain because their website is dumb. thanks to you and fohat, i ordered some up. Do you guys loctite these or is that overkill? Very useful tutorial, but I think we missed the most important part of it: the last one - how to put all thes f#$%&d "hammers" inside their position, how to bolt the chimneys plate to the steel plate without moving the hammers and how to insert everything under "U" hooks. The bolt head thickness, for an M2 bolt, is 1.6 mm, same for the M2 nut (slim nut can be 1.2 mm). Problem n. 3: How to keep hammers in their position? With a scotch tape every one? Any suggestion? How have you continued the assembly? 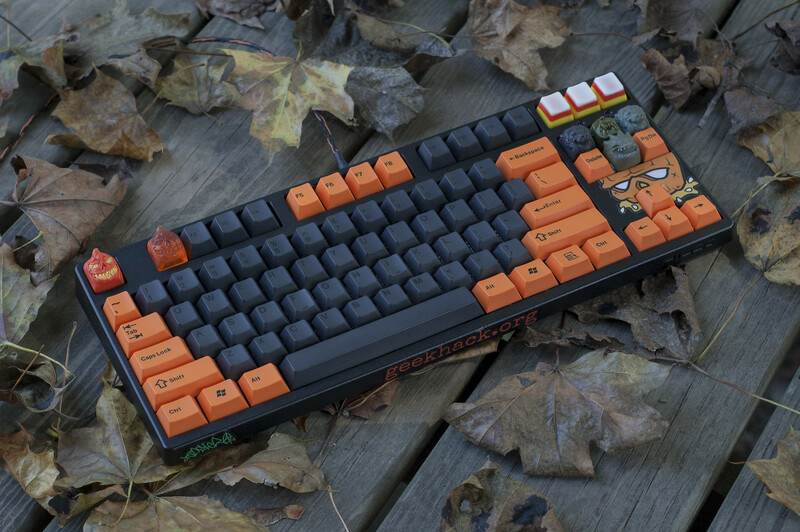 Take the keycaps off. Hold the plate up by resting it on something on both sides (so the springs can stick out the barrels) before installing all the hammers. 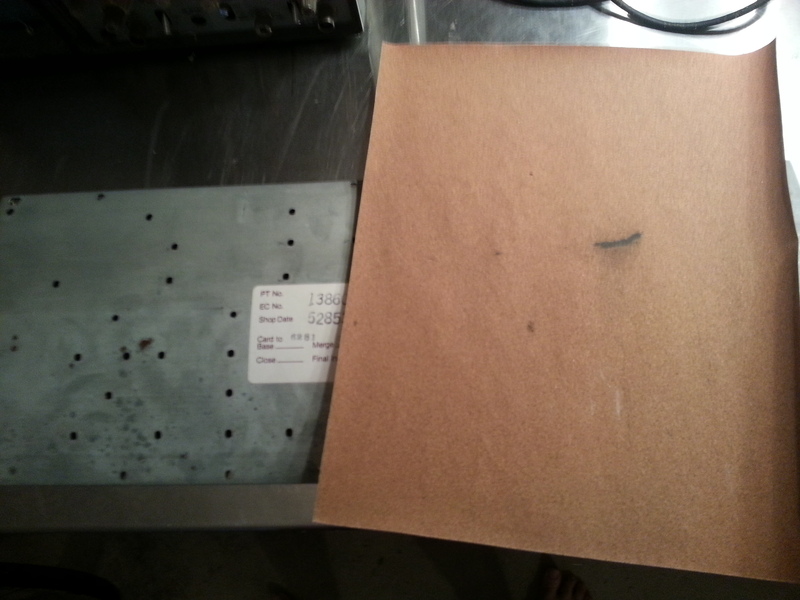 Then put the layers on in order (rubber sheet, membranes, steel plate). Not missed, I just took all the pictures the next day and have uploaded them but not written anything yet. These tings take time and I had a weeding to attend this weekend. I have some tips as keeping the hammers in place can be a bit of a challenge. I usually use the two case pieces or some book to elevate the barrel frame so the springs don't make them pop outof place when I'm reattaching the bolts, but making a frame is the best choice by far, especially if you want to do it more than once. 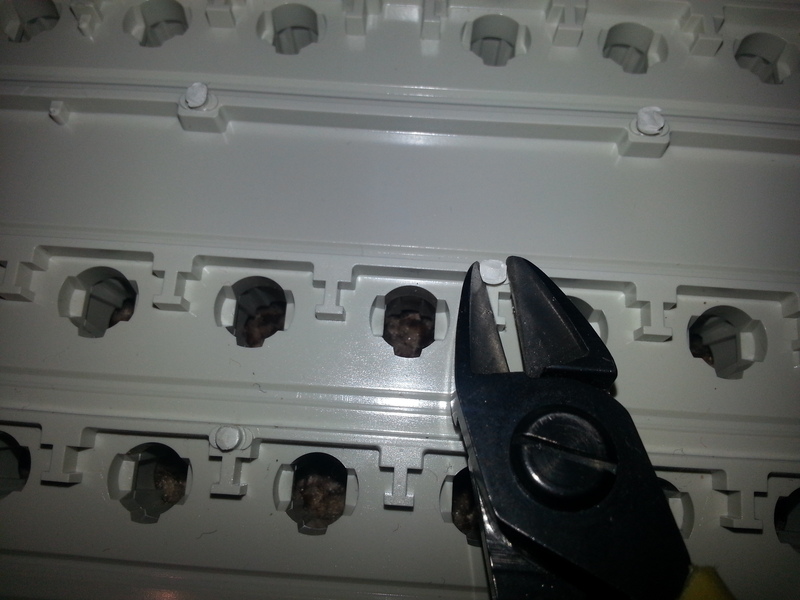 Answer to problem #1: The nuts show less than 1 thread above, even when fully tightened. Any longer bolts and it will not fit in the case. Any shorter and there is not enough room for the nuts. I will have pictures. Answer to problem #2: you will have them contacting each other in the front. The front edge will fit very tightly because of this, but it will still work. This is one reason I leave the front row bolts off. If you want to use bolts on the front row, you will need to put them in the opposite way. Answer to problem #3 is above. Some people use tape, but I find that it just helps you quickly remove them and put them back, not hold them in place. I will have the rest of this guide up soontm. I had a weeding to attend this weekend. I wish that I had attended a weeding this weekend. There are no nuts and bolts in Italy? OK, nuts I know there still are plenty especially in Rome, but am surprised about the bolts thing. Can't imagine the proud makers of Ferrari ordering such basic things from abroad. Fohat, I remember you live in a suburb? Is your neighborhood association coming after you for not cutting the grass already? I lived in a suburb only briefly. Enough to hate it as much as the commies and Nazis hated each other. That place was full of goose stepping Nazis who won't even let you paint your door a different color. Oh, and surprisingly they were female. Dunno if that's representative of neighborhood Nazis in the US. Finished doing mine and I love the feeling of the Unicomp blanket. Highly recommended to others taking on a bolt mod. Yeah, blanket is awesome. Glad you enjoyed it. If I may ask what year / version model M do you have? As Dorkvader recommended, I ordered machine screws and hex nuts for this project from McMaster-Carr. However, they cancelled the order because I was in Canada, saying that they "accept international orders only from businesses." 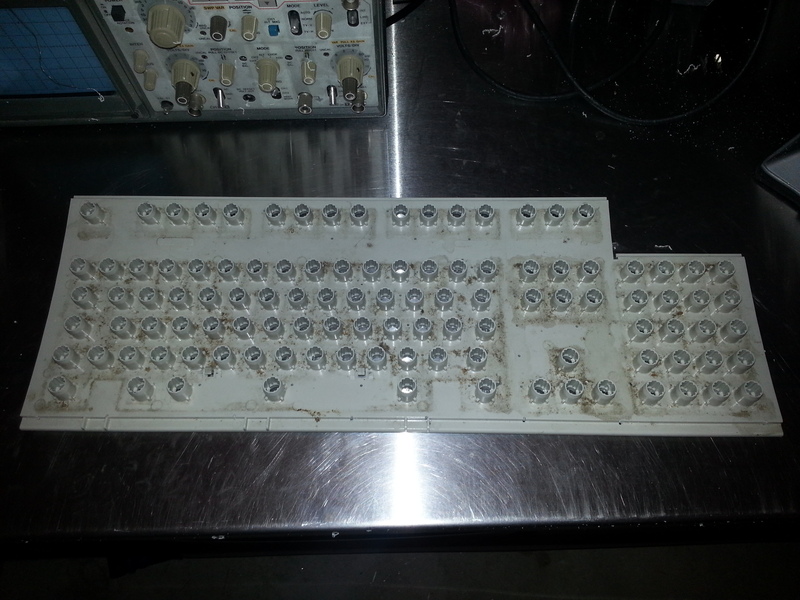 McMaster-Carr sells better quality, so the cheap Chinese gear will probably give you a few stripped nuts. Even though M-C is "local" for me (still half an hour each way) I have started buying on ebay. 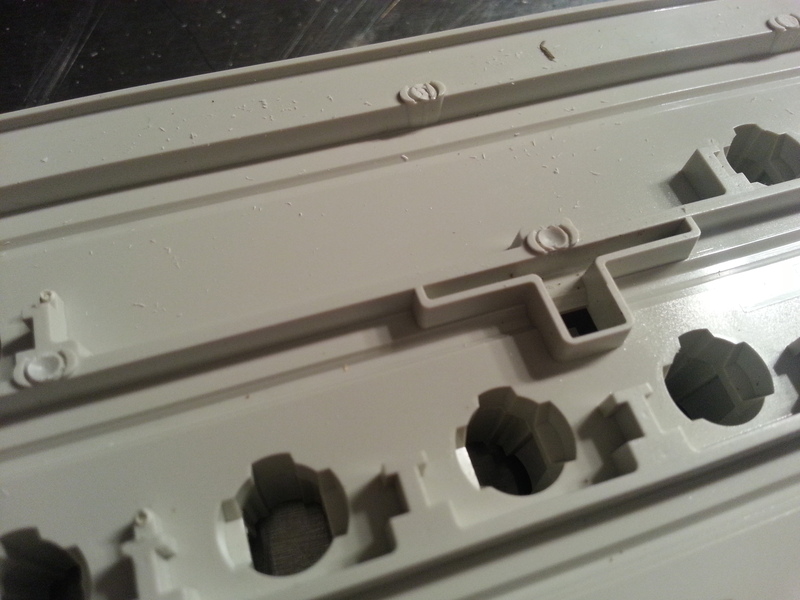 However, don't worry, because you are replacing little melted plastic sticks with steel hardware! Who is your preferred ebay seller for this? Random. I have only done it twice, I just search something like "M2 8mm machine screw" and that usually produces nuts and washers as well. Unfortunately, my only other choice would be to buy them at a hardware store for 50¢. For each pair. Even though M-C is "local" for me (still half an hour each way) I have started buying on ebay. [to E TwentyNine] Random... 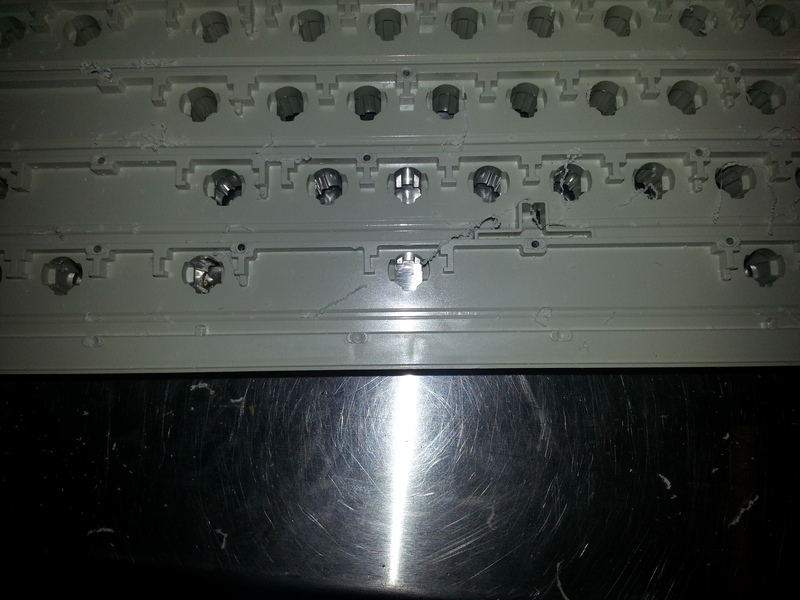 I just search something like "M2 8mm machine screw" and that usually produces nuts and washers as well. So you’re getting the same “cheap” stuff now? I’m wondering why you brought it up, then. In several of my guides I posted a receipt from McMaster-Carr to show the sizes and types of hardware that I bought from them. They really aren't very expensive, but apparently international buyers have a problem. Anybody should be able to get cheap hardware from China if they are willing to wait 3 weeks. 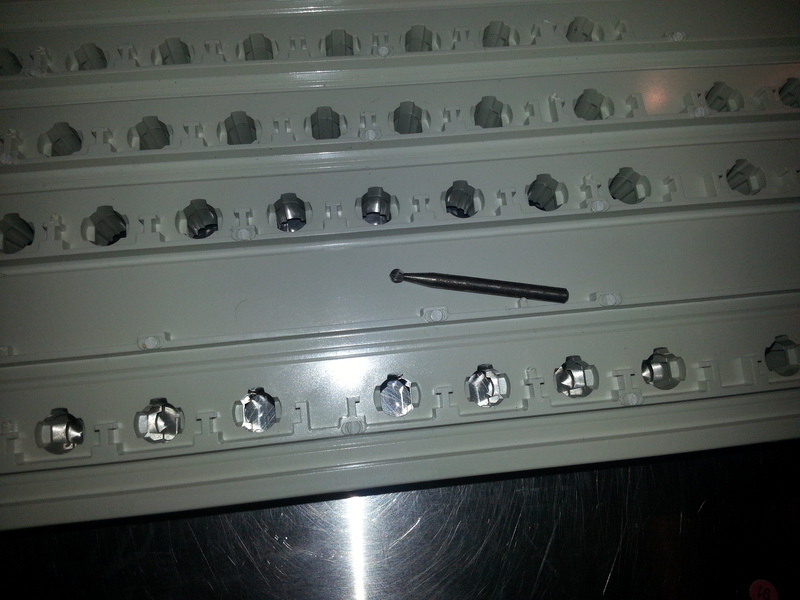 Hardware stores around here don't carry screws that small at any price, even M3 is rarely available. My relationship with Oliver Stone is certainly love/hate with more hate than love. I come out of his movies exhausted, frustrated, and angry every time, but they are entertaining. He can create a powerful experience, but I fear that with the decline of real news reporting and with people no longer reading, the twisted, eccentric viewpoints he puts forward will take on a greater false "historic significance" than they deserve. Perhaps, but I can't say I found his depiction of Dubya very far off the mark. I think the problem there was that the real person and events were so unlikely, the movie couldn't possibly be as ludicrous or alarming. Does the Unicomp blanket have any effect on the amount of spring pinging compared to the original IBM blanket? I like the idea of increasing the crispness of the clicks, but am not fond of pinging. 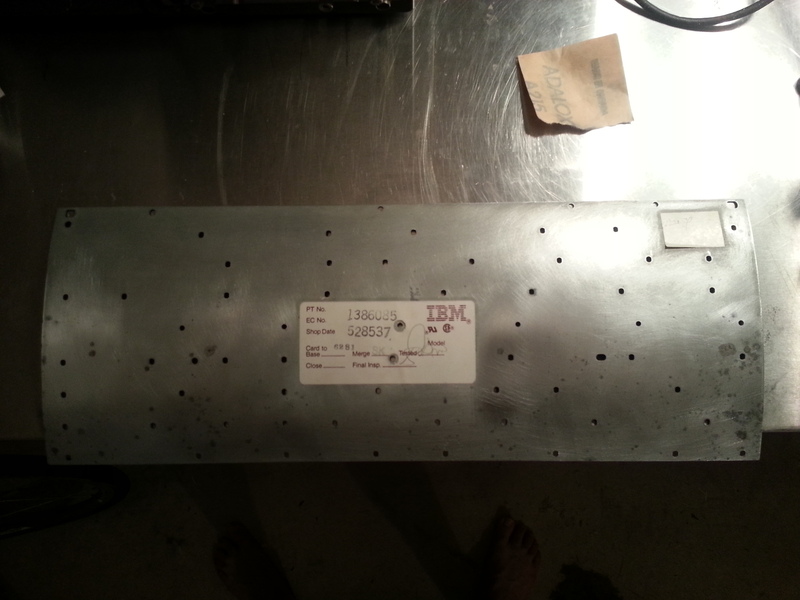 I am about to complete this mod on an SSK. Once the screws get here. I was planning to do a floss mod (well, paracord instead of floss) to address the pinging anyway but I'll try it without floss a bit first and let you know. I've done a few experiments with floss modding on Model M's, using the often-recommended round floss, but found that either the pinging was not adequately reduced or that it muffled the click. Seems like sharp, crisp clicks and excessive pinging go hand-in-hand, and that reducing one also reduces the other. So your results using the Unicomp white blanket with and without the paracord mod will be most interesting. On the subject of spring pinging, I've sometimes found that re-seating the spring on the pivot plate (i.e., the "hammer") reduces pinging. If the bottom couple of coils on the spring are lifted slightly at the 12 o'clock position of the retaining stud on the pivot plate, then clicks may be softer and pinging may be increased -- the one instance where softer clicks may be accompanied by excessive pinging. By pressing the spring coils down all the way at the 12 o'clock position of the retaining stud, the spring will not lean forward as much and produces a sharper click when it buckles. I'm not sure why this reduces pinging, but it may be that the acoustic coupling between the spring and the pivot plate are improved, thereby increasing the ping-damping effect of the blanket. I'm going to try the paracord because I read somewhere on here that someone takes out the strands from the core and uses that. But I would love to find something a bit less labor-intensive that can do the same thing. So I've also ordered some #18 nylon cord which is meant for beading and crocheting. Maybe that will work. I'll record both with my ATR-2500 so I should have some high quality audio samples for everyone to check out. 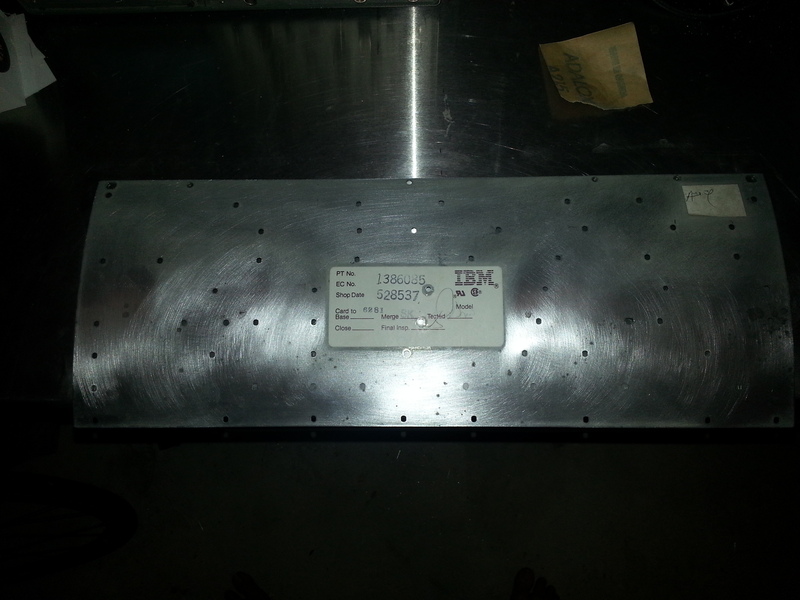 Does the Unicomp blanket have any effect on the amount of spring pinging compared to the original IBM blanket? I like the idea of increasing the crispness of the clicks, but am not fond of pinging. The thin latex blanket does make for a crisper feel, but a Model M will never be even remotely as crisp as an F.
I would not use the word "ping" for a Model M in the same way that I would for a Model F, since there are very few of the higher overtones in comparison. The sound of the M is deadened somewhat, but not in the satisfying way the way that it is for the F, since the M is rather dead already. To me, a floss mod is essential for every Model F I own, but I have stopped doing it on Ms altogether. Also, I took some of the internal strands out of (military surplus) parachute cord that I have, and it seems much tougher and denser than the Oral-B Superfloss that I have used. I definitely don't want to kill the (already dampened) crispness of the Model M's buckling springs, which is why I'm going to try the third "secret" item I mentioned above. Fohat, your comments remind me of one of my earliest experiences with the Model M. It was back in the late 80's, when the Model M had already replaced the Model F, but Model F's were still available at many surplus electronics dealers. I saw some of them at one such dealer, but passed on the opportunity and opted for an "up-to-date" Model M instead. My initial reaction to the Model M was much as you describe -- it seemed a bit "deadened" and "plastic-y" by comparison to my memory of the Model F's I had recently seen at the surplus dealer. There was just some elusive, "more mechanical" quality about the F's keystrokes that seemed to be muted in the M. Maybe it was the significant differences in not only the amount of ping, but also the harmonic structure (as you pointed out). The F "sings" when you type on it rapidly, more so than an M.
Furthermore, the "click" on the "F" has a bit more "whack" to it -- probably (as someone else has pointed out) due to the larger and more massive "flipper" in the F smacking down on the hard surface of its PCB; compared to the much smaller and less massive "hammers" (pivot plates) of the M striking the soft rubber blanket in the slightly-compressible "strike zones" of the mylar membrane sandwich of the M, somewhat muting the spring pinging and the buckling click and minus the "whack" component of the F's actuation point. 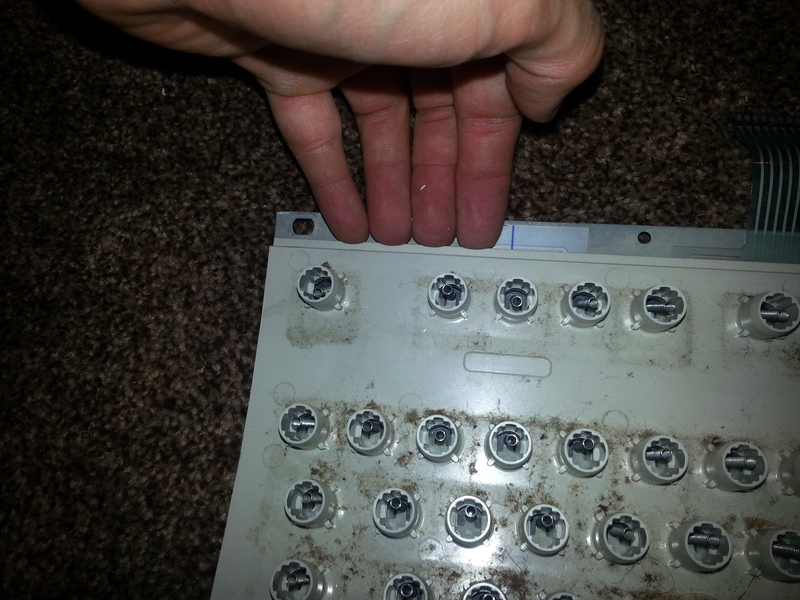 BTW, can someone confirm that the Model F's flippers actually do make physical contact with the PCB? I'm assuming they do, but I don't know this for certain. Wouldn't they have to make contact to complete the circuit? Or do I misunderstand how the Model F works? No contact is necessary in theory -- but may be incidental in the F -- because the F works by sensing the capacitance change between the pads on the PCB. Very close proximity is required, but actual contact may not be. I guess it depends on the threshold sensitivity of the particular scheme.